Commonly a headend System distributing a satellite television signal in a hotel television systems is known as a SMATV System or Satellite Master Antenna TV. An L-Band type satellite TV distribution system is best described as a video service for multiple users provided via satellite antennas where an in-room receiver is used to make the channel selection and each receiver receives the full programming package subscribed to. The in-room receiver is generally located near to or attached to each television (similar to residential installation). Conversely, in a COM1000 Pro:Idiom headend or COM2000 HD head end system, one blade or receiver carrying two channels is placed in a rack system and the encrypted signal is then distributed via RF output to the guest rooms. Both COM1000 and COM2000 headend systems require a Pro:Idiom TV in each room to decrypt the signal. Access to a full Lodging & Institutions channel lineup with up to 100 HD channels. DIRECTV’s new Residential Experience for Hotels is an L-Band type Satellite TV distribution system that provides your guests with the same TV viewing experience & programming options they have at home and is available to your hotel. DIRECTV Residential Experience for Hotels or DRE, is groundbreaking technology that gives your guests the ultimate entertainment experience with the full residential channel lineup they love at home and gives you a cost effective way to upgrade to HD, have more control of your TV system, and easier maintenance, all at a much better price than Cable. 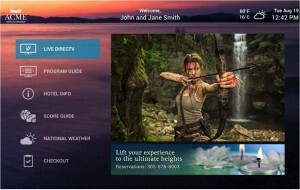 In 2014 DIRECTV added the NEW Hotel Welcome Screen system to improve your communication with your guests, giving you a way to advertise events, restaurants and specials in your hotel. With interactive apps and up to 50 pages of locally inserted information along with Express Folio Checkout capability, it will enhance your guest’s experience and improve your staff’s efficiency. One of the benefits of L-Band distribution systems is that they do not require the more expensive Pro:Idiom type Hospitality TVs to provide your guests with high definition (HD) TV service and as such are a perfect option for smaller hotels & motels. Its All About Satellites can work with or provide you with most brands of commercial TVs at manufacturers direct pricing. An L-Band type satellite TV distribution system is also a great option for hospitals, dormitories and assisted living facilities. L-Band satellite TV distribution systems allow you to give your guests the HD programming they are demanding in a very economical manner.